Train Horns - Barry Electronics - Since 1979! Want to make your vehicle as loud as a freight train barreling through countryside? Have you ever felt the need to let people know you were there, even if they were 2 miles away? If so, you should consider installing a Train Horn on your vehicle! 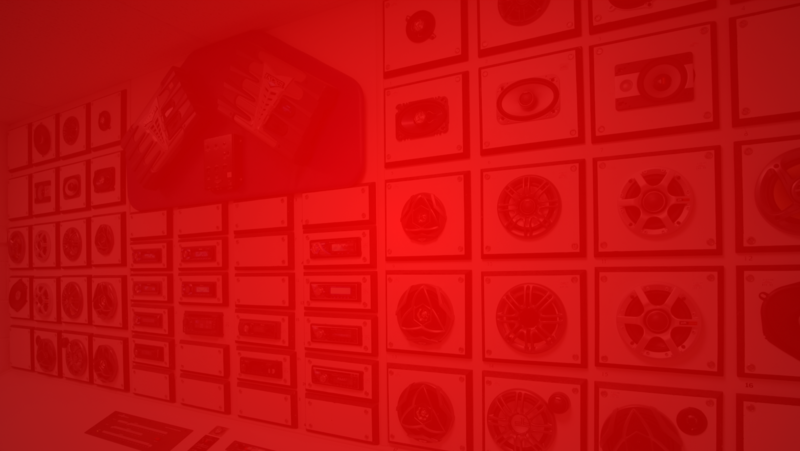 We have a large selection of sounds, sure to meet your needs! Installation price will vary from vehicle to vehicle. All horns can be ordered in our retail store, and can be installed by our staff, or sold as a do it yourself option. Available for order in our retail store. We Featured The SHOCKER train horn in Episode 2 of Barry Electronics TV. Watch below for a brief demo, and click here if you would like to see any of our other videos. Cannonball Express When a truck owner demands a ultra powerful horn, the CANNON BALL EXPRESS is the one to choose. Gives any truck a true train horn sound. Constructed of all metal with three (3) triple chrome plated trumpets. The horn's base is plated steel. The Cannon Ball Express requires an on-board air system. Comes with all required mounting hardware and 10 foot length of 1/4" nylon high pressure hose. *Call for pricing on this unit. 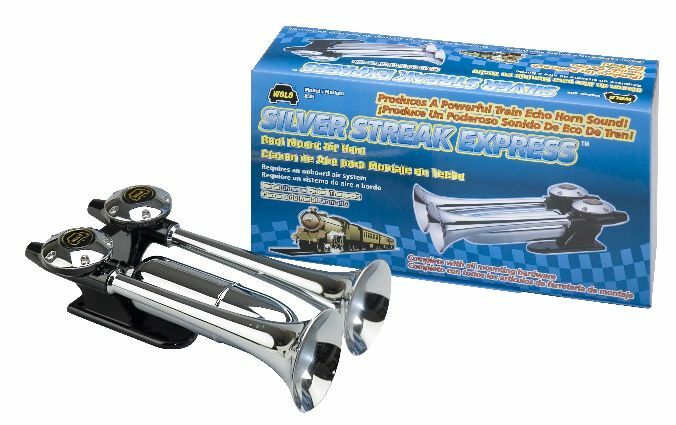 Silver Streak Express Specially constructed horn built with an extra air chamber to produce a powerful train horn sound. This attractive horn produces a echo sound that replicates the horn of a speeding diesel locomotive. 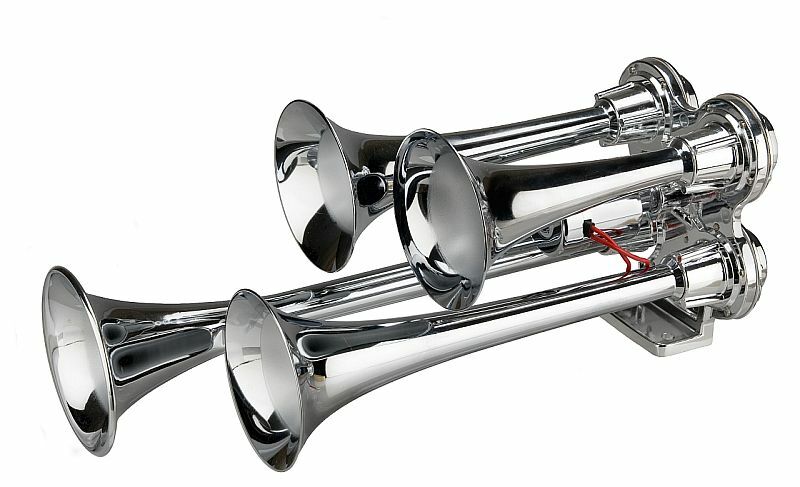 The trumpets of the Model 835 are entirely metal, triple chrome plate for all weather conditions. The metal mounting base secures to the vehicle with stainless steel bolts, which will provide a secure watertight installation. The air feed connection has been designed to mount easily and to be hidden from view. The Model 835 will enhance the appearance of any truck. Requires an on board air system which we supply. Comes complete with all mounting hardware and air fittings. BIG BAD MAX is the perfect choice for all 12-volt vehicles: cars, trucks, motorcycles, boats and etc. The one-piece patented design requires no hoses like conventional air horns. 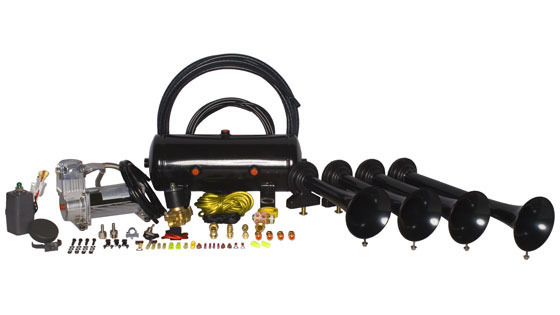 Easily installs with one bolt that is provided, transfer the vehicle’s factory horn wires to BIG MAD MAX’S compressor and the installation is complete. Built with a heavy-duty compressor that is maintenance free assuring years of dependable service. The housing is made from super strong ABS plastic with a black stealth finish. If you want a deep sounding powerful air horn sound, go no further, BIG BAD MAX is the horn for you! Perfect for getting a big sound on a smaller budget. $89.99 available for order in our retail store. 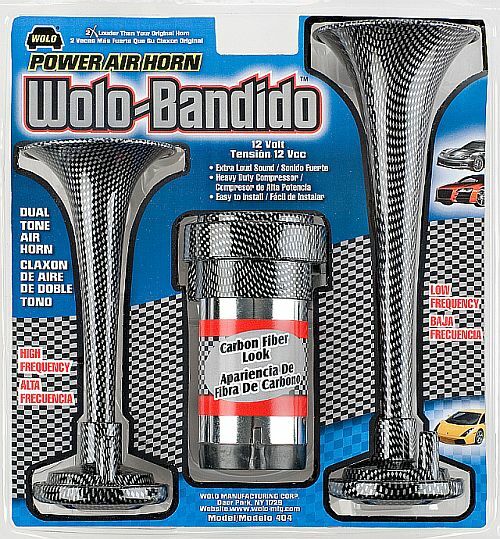 Wolo-Bandido AIR POWERED-VERY LOUD – Choice either 12 or 24 volts. Two durable plastic trumpets and compressor cover with the high-tech carbon-fiber look. Transform an everyday engine compartment into the picture of style and performance. The WOLO-BANDIDO is manufactured with a hydrographic clear-coat process, which provides a durable high-definition carbon-fiber-look. Installation is easy with Wolo’s compact chrome compressor that is maintenance free. Kit comes complete with all needed mounting hardware, hose and relay. Another great budget air horn, available for order in our store, $59.99.